The brick base on the manhole should be made to follow the shape and size of the manhole cover or frame, the clear opening of the manhole cover should not be less than the one of manhole. There should be a 40cm width of concrete to be filled around the manhole cover or frame for support and protection. A 20cm width of concrete may be acceptable when the manhole cover is installed on the cement surface road with reinforced bars (Read below Installation Improvement). A layer of concrete is recommended to fill between the frame and base bricks to hold the manhole covers tightly. In practice the filling width and STRENGTH of the concrete to be made depends upon how busy and heavy the vehicles access to the covers. The surface of the manhole cover must be at the same level as the surrounding concrete should the manhole cover to be installed be expected for the access of the vehicles. While installing on the asphalt road, ensure that the construction vehicles will not be driven over the basement of the manhole cover. For better appearance, the installed manhole cover can be covered by something such as a sheet of plastics during the road construction work. After the cement surface road work is completed, open the manhole cover and clean it, and ensure the cover would not be stuck. Wash and clean the cover surface as well. Keep the manhole cover not to be accessed for 10 days by sign and blockage device before open the access to the public. The incorrect installation described below should be avoided. The polymer manhole covers have to be installed properly, especially in busy walkway and driveway. Unfortunately we do not provide the installation services for our manhole covers sold. The above image shows five kinds of incorrect installation of polymer manhole covers. There may not be any problems if no vehicles access to the places, should the vehicles be driven over the manhole covers installed in such ways, the manhole covers would be damaged and not last longer. Polymer or BMC manhole covers are not as flexible as cast iron ones, without the support and protection of the surrounding concrete the edges of the cover and frame may be damage if they expose to high "point force", when the wheels "hit" or crash them. When the wheels of vehicle start to move, stop suddenly, or "jump" onto the covers as crash, the wheels apply higher point force to the cover or frame than they roll over as usual. Should such a crash force be over the load capacity of the manhole cover, or the force limitation it can stand, the damage may be caused. 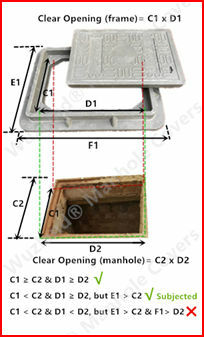 Incorrect 1: Clear opening of the manhole cover is less than the one of manhole, this makes the part of frame which holds the cover hanging over the manhole, and without the support of the base, the frame may be damaged while the vehicles passing over. Incorrect 2 & 5 : The surrounding concrete is higher than the surface of the manhole covers, the wheels will "jump" and crash onto the cover and may cause damage if the duty of the manhole cover selected is not high enough to resist such "crash", especially when the vehicle is speeding up. Incorrect 3 & 4: The manhole cover is higher than the surrounding concrete, when the vehicle is passing over, the wheel will act as digging then jumping, and may damage the frame and cover. It may happen for the wheel to crash directly to the edges of cover and frame while the vehicle is speeding up. In the above image, the left picture indicates the distribution of force when the wheel rolls over the manhole cover. 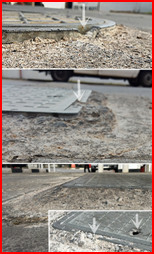 We find 30% of the force go sidewards, this may explain why the concrete surrounding the manhole covers usually start to be broken earlier, this make the manhole covers not be protected and easily be damaged as shown in the right pictures of the above image. The duty of the concrete to be made should be well considered. There is no maintenance required for the polymer manhole cover itself but the surrounding concrete which should be repaired in time if damaged before the manhole cover would be broken without its protection and support. This manhole cover was installed on the driveway, the frame was damaged because it did not have the fully support from the base, one side of the frame apparently hanging over the manhole, i.e., the clear opening of the manhole cover/frame is shorter than the manhole. 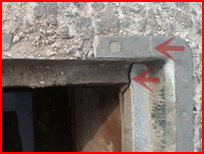 Here are the examples of damaged frames due to the incorrect installation 3 and 4 described above. We all know to break into the door, it's more easier to success by kicking than pushing, that's why jumping wheel may cause edge damage especially to the frames while rolling one doesn't.